Strategy. The Strategy entails needs-assessments through diagnostic missions, the development of a comprehensive strategic plan, the implementation of WCO standards, and the regular monitoring of performance indicators. Key WCO CB tools to support these actions include the Diagnostic Framework and the Capacity Building Development Compendium. 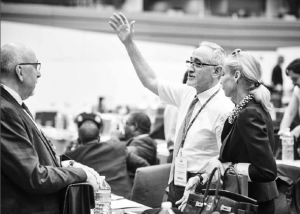 During the reporting period, over 300 WCO Member support missions were delivered, including a number of specific strategic planning missions, and five evaluation monitoring missions under the auspices of Phase 3 of the WCO Columbus Programme. CB delivery during such missions is based on a two-pronged approach, namely ‘ownership’ and ‘results-based management’ (RBM). RBM ensures that strategic planning and implementation management are guided by focusing on the desired results. This requires effective performance measurement (PM) in order to effectively demonstrate the impact that activities have on organizational performance. The WCO also provides technical assistance on the use of PM contracts between Directors General of Customs and frontline Customs officers. In collaboration with the United Nations Conference on Trade and Development (UNCTAD), the WCO has developed an effective PM module based on data extracted from the ASYCUDA automated Customs clearance system. As the WCO continues to refine the CB Development Compendium, changes have been made to enhance Chapter 5 of the Compendium, which deals with ‘Project Management and Action Planning,’ two essential tools for the effective management of Customs reform and modernization programmes. The new draft chapter sets out a practical approach to the management of projects based on experience and feedback from WCO Members. Further updates to Chapter 5 are planned, which will cover guidance in establishing a ‘Project Office,’ and include additional case studies. WCO activities focusing on human resource development include the enhancement of the e-learning catalogue, the delivery of support relating to the Leadership and Management Development Programme (LMDP), the development of material to support the Framework of Principles and Practices on Customs Professionalism (FPPCP), the development of the People Development Diagnostic Tool (PDDT), and organizing the first session of the Virtual Customs Orientation Academy (VCOA). Twenty-two new or updated modules are now available on the WCO CLiKC! Platform. New e-learning courses cover post-clearance audit (PCA), risk management (RM), coordinated border management (CBM), and the RKC. These new online courses represent more than 35 days of training. The WCO has continued to support national roll-outs of the WCO e-learning courses by its Members. Assistance has been provided to Sub-Saharan Customs administrations to review their national training strategies, and to integrate the WCO e-learning catalogue into their training curricula. Burundi, Kenya, Rwanda, Tanzania and Uganda have been assisted in the modernization of their training programmes in cooperation with the East African Community (EAC), while Cameroon, Mauritania and the Seychelles have benefited from activities to develop new blended training strategies. The LMDP is intended to improve the capability of Customs’ leaders and managers, in order to drive reform and modernization. Twenty-three LMD workshops have been conducted in the reporting period, and two e-learning modules – to be completed by nominated participants ahead of an LMD workshop – have also been developed. The e-learning modules introduce concepts around leadership and management, and contain an introduction to, and the context of, an LMD workshop. A special focus on modern Customs organizations and integrity has been incorporated into the modules. During an LMD workshop these concepts are further explored, taking into account an administration’s actual situation. To enable the WCO to measure the impact of LMD workshops on Customs organizations and individual participants; a ‘monitoring and evaluation’ concept is now being developed. 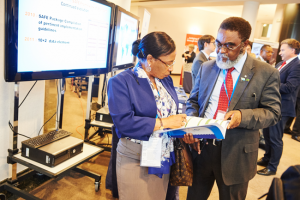 The ninth and tenth National Policy Dialogues, which bring together senior representatives from government and business in the WCO East and Southern Africa region, were held in Mozambique and Rwanda respectively. In addition, two successful pilots were undertaken to test the concept of a ‘Top Executive Retreat.’ Participation in the retreat will be offered to executive teams from national administrations, as a way to further strengthen their capacity in implementing change and in achieving organizational results. The Map provides a live overview of the Customs community’s initiatives and solutions that have been implemented worldwide, in order to efficiently manage competency-based human resource (HR) processes. 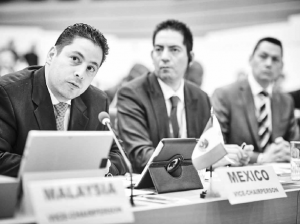 The WCO has updated different chapters of the FPPCP, incorporating the latest best practices. It has also started to deliver assistance to a number of WCO Members in implementing elements of the Framework, which was used as a basis for WCO HR management workshops in Montenegro, Qatar, Serbia and Sudan. The PDDT is intended to serve as a practical guide for administrations, which will enable them to gauge where they stand in the context of Customs international standards and best practices. It has been recently trialled in Namibia, and will also be used during HR management diagnostic missions by WCO facilitators. From 4 August to 24 October 2014, 33 Customs officers from 22 administrations participated in the first session of the VCOA, a WCO initiative aimed at providing newly recruited Customs officials, having less than two years’ service in Customs, with basic knowledge and skills in international Customs standards. Tutorship and technical expertise was provided by the WCO, as well as by experts from WCO Member Customs administrations. Fourteen tutors from five WCO Members took part in the session, giving lessons, conducting live chats and hosting short webinars, as well as enlivening the course and various assignments – individual or collaborative – and evaluating the students. Participants had to follow four modules of tutored virtual online training and complete all assignments and exercises, requiring an investment of around six to ten hours per week of their time. Upon completion of the activities, and after being evaluated, 29 successful Customs officers were awarded certificates. The West African Customs Administrations Modernization (WACAM) Project, funded by the Swedish Government, was designed to support modernization in West African Customs administrations till the end of 2014 in the fields of HR management, stakeholder relations, and resource mobilization. The support took the form of regional workshops for discussion of best practices related to these areas, and included national support missions. The project is now entering a second phase. This phase will focus on assessing the results achieved, identifying lessons learned and challenges met, as well as developing a pool of regional HR experts capable of undertaking diagnostic missions and piloting HR modernization projects in their administration or in other administrations that form part of the West African region. the delivery of an integrity diagnostic in Colombia. In addition to the above listed support activities, assistance has been provided virtually to WCO Members in 10 cases, comprising support in areas such as providing comments on integrity documents, checking codes of conduct, obtaining information from other administrations, etc. With the help of a number of Members, two new WCO tools have been produced: a ‘Guide to Corruption Risk Mapping,’ and a ‘Guide to Prevent Procurement Corruption in Customs.’ WCO Members are invited to submit additional information and examples to further supplement these two guides, which will remain ‘living’ documents. 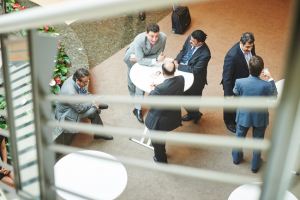 In addition, the tenth and eleventh issues of the WCO Integrity Newsletter, containing articles on Members’ best practices, have been published. Included are articles on reforms undertaken in Ecuador and the Philippines, as well as articles on the policies and strategies applied in France, Italy, Jamaica, Korea, Malawi and Paraguay. This engagement entails cooperation and coordination with many actors, including governmental policy makers, development partners, and donors. To guide WCO Members, a 10th chapter on the subject of ‘Donor Engagement’ was incorporated into the CB Development Compendium. This chapter has been revised, and provides additional guidance on the preparation of a business case, how to organize regional and national donor conferences, and how to prepare project proposals according to a donor’s expectations. It also includes additional guidance on the monitoring and evaluation of projects. 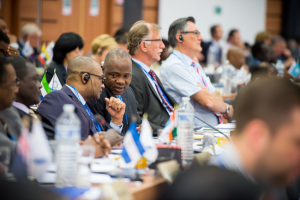 To assist WCO Members in their interactions with policymakers and the need for continuous investment in Customs, the WCO developed an ‘Orientation Package for Decision Makers,’ which provides a clear picture of a modern Customs service and the vital part it can play in achieving national objectives. It is aimed at assisting Customs administrations to secure support for reform and modernization. This year, a new Annex on the World Trade organization’s (WTO) Trade Facilitation Agreement (TFA) has been added to the Orientation Package. The Annex will hopefully provide Directors General of Customs with the necessary intellectual ammunition that will support their role in the implementation of the TFA. Significant progress continues to be made by the WCO in securing funding for CB, and in fostering dialogue with international and regional development banks, donor agencies, and other development partners, critical activities to ensure momentum in the area of Customs reform and modernization. Her Majesty’s Revenue and Customs (HMRC) in the United Kingdom.